It’s finally June and the hot weather is here. With the week hitting mostly in the 70s, it’s time to enjoy some nice, refreshing ice cream. Of course, we still enjoy ice cream in the chilly weather we know so well, but there’s just something special about eating ice cream when it’s sizzling outside. We at the Clog can’t wait to dig into some Ici Ice Cream or gelato from Almare, but first we want to take a moment to remember the time before we knew of these Berkeley ice cream staples. Here’s our ranking of our favorite childhood ice cream snacks. With a choice of cotton candy, chocolate eclair, cookies and cream or strawberry shortcake, there was always something for everyone. This ice cream treat gave you the perfect combination of crunchiness and creaminess. Sundae Crunch popsicles were a staple of every home during the summers! Who doesn’t love chocolate? Fudgesicles gave us the overdose of chocolate that our younger selves constantly craved — talk about chocolate wasted, right? Always leaving a mess on our faces, fudgesicles may not have been our parents’ favorite but there was no way we could stay away. Not the biggest fan of chocolate? No problem! 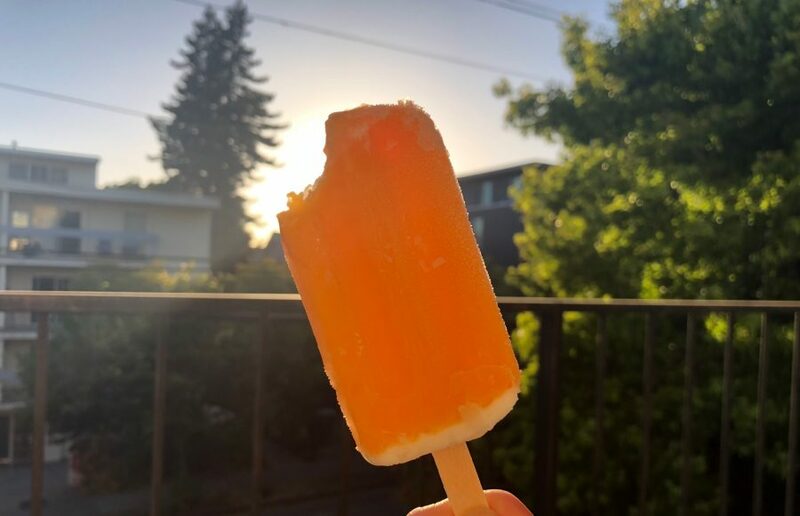 These creamy orange pops were the next best thing. These really redefined a new taste of “orange.” Seriously though, these were the only orange-flavored ice cream bars that I ever ate. There was something thrilling about pushing your ice cream out of a cardboard cylinder. Push-Up popsicles were some of the most fun to eat. If you were like my family, you’d save the plastic “pusher” to use as microphones to perform your own concerts at home — Backstreet Boys songs were our go-to jams. Snow cones aren’t really considered “ice cream,” but they get a spot on our list! Snow cones were simple but oh-so-satisfying. You could flavor these ice rocks with almost anything, and I mean anything. There were the traditional cherry and blueberry flavors, but you could also use some lemonade powder to make a frozen treat that would melt into a delicious drink. You could get these bad boys in almost every one of your favorite childhood characters. From Teenage Mutant Ninja Turtles to Spongebob to my personal favorite, Bubbles from the Powerpuff Girls, these treats were definitely tasty. The bubble gum eyes gave them a creepy feel, but we couldn’t resist! Frozen otter pops were some of the most cost-effective “ice creams.” Coming in big bulky packs, these bad boys lasted the whole entire summer. The best bits of these treats were the juices that melted at the bottom of the package. These firecrackers were perfect for Fourth of July festivities. I mean, these red, white and blue popsicles just scream summer! So there you have it, folks — our ranking of some of our favorite childhood ice cream treats. The summer heat is finally making its way to Berkeley! It’s time to hit up the grocery stores to relive our childhoods before the summer sun goes away.